Our interview with Ishaan Khatter begins on a sombre note. This is not because the 22-year-old actor and dancer, who makes his debut in Beyond the Clouds, Majid Majidi’s first Hindi film, takes himself too seriously. It’s the film soundtrack he’s listening to in between interviews — A Prophet (2009) — which is all doom and gloom and out of place at the Jubilee Room of the Hotel Sun-n-Sand, in Juhu at 2 pm. Khatter appears to read our thoughts and turns the music off. “It’s an excellent film. Cinema has been my biggest teacher, and it’s been a natural progression to join the profession,” he says. Nobody doubts it; Khatter’s mother is actor Neelima Azeem and his brother is Shahid Kapoor. But with his big eyes, long lashes and heart-shaped face, Khatter’s charm is all his own. “I auditioned for the role. Honey Trehan, the casting director, is somebody I’ve worked with as an assistant director in Udta Punjab. He called me and told me about Majidi sir. I met him and was given a brief of two scenes, and asked to improvise the rest. With the help of two assistants, and live locations in Versova and Goregaon, we shot all through that evening and later at dawn. It was labelled a mood shoot, with 50 minutes of footage. Majidi sir watched all of it, and he told Honey to lock me for the role,” says Khatter, who spent the next three months shooting for the film on various locations in Mumbai and Sambhar in Rajasthan. 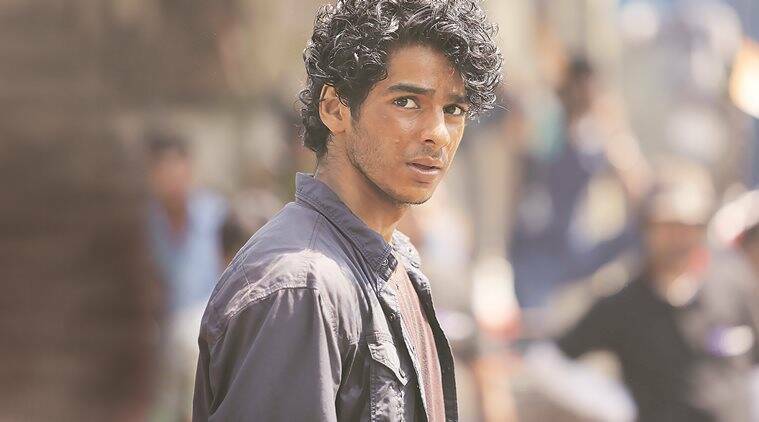 In Beyond the Clouds, Khatter plays Amir, and shares the screen with Malavika Mohanan, who plays his sister, Tara. A streetwise hustler, Amir gets into a spot of bother with a druglord and Tara is caught in the crossfire. “It’s a different energy when your co-lead plays your sibling, as opposed to a love interest. It has not really been explored in Hindi films. Malavika and I had no time to prepare for the kind of chemistry we would have because there were no workshops or readings — Majidi sir doesn’t do those things,” says Khatter. During the shoot, he grew close to the Iranian auteur. “I didn’t want to miss this opportunity of watching him work, so I was at every look test for every character. I would be on the sets everyday to assist in any way. Or just to give him a massage. Majidi sir would turn to me and say, ‘Amir’, point to his shoulders and add, ‘very important’,” he says and laughs. By the end of the film, Khatter picked up a smattering of Farsi from Majidi. “What’s remarkable was that if an actor got a dialogue wrong in Hindi, he instinctively knew. He’s so attuned to his work,” he says. While the initial reviews of the film have been unfavourable, Khatter has been singled out for praise for his ease in front of the camera, whether it is a fight sequence, or just running. “Haha, I feel like I’ve run straight from the frame of Beyond the Clouds into Dhadak,” he says. Dhadak, a Dharma Productions remake of Nagraj Manjule’s hit drama, Sairat (2016), also features Janhvi Kapoor. “I’ve been chosen by these filmmakers, and I couldn’t be luckier. I’m aware of the responsibility of playing these roles, and how important a film based on Sairat is for the country at this time. Cinema has helped me engage with social justice and, if there’s any way I can contribute, I want to do it my own way,” he says.